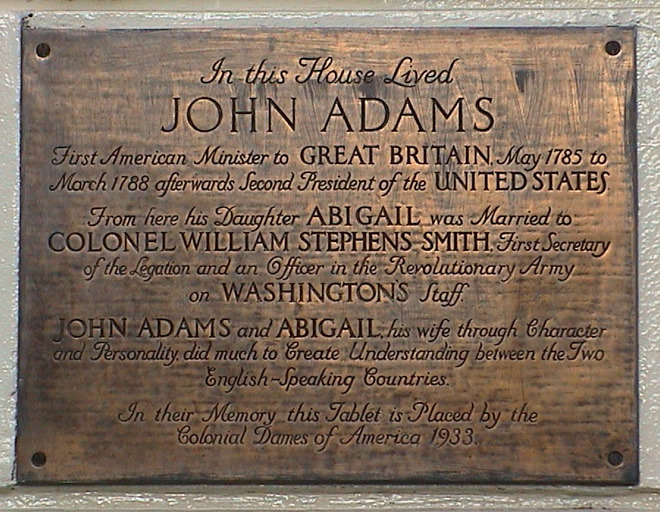 In this house lived John Adams, first American Minister to Great Britain, May 1785 to March 1788, afterwards Second President of the United States. From here his daughter Abigail was married to Colonel William Stephens-Smith, First Secretary of the Legation and an officer in the Revolution Army on Washington's staff. 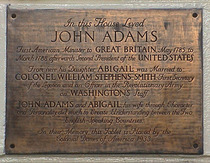 John Adams and Abigail his wife, through character and personality did much to create understanding between the two English-speaking countries. In their memory this tablet is placed by the Colonial Dames of America, 1933. Nicknamed "little America", the association of Grosvenor Square with America began when John Adams, later President, moved to this address in 1785. The US embassy is (2013) at no 1.